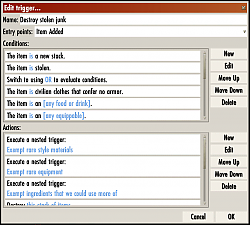 ItemTrig is an inventory management add-on that allows you to define custom rules, to automatically perform actions on items in your inventory. Custom rules come in the form of triggers. Each trigger has entry points, conditions, and actions. The entry point decides when ItemTrig should attempt to test the trigger's conditions; if all of the conditions are met, then the actions will be performed in sequence. This allows you to define flexible rules for handling items as they enter your inventory, or when you open certain services (e.g. crafting stations, merchants). 1. The item [is] an [any equippable]. 2. The item [is] intricate. 3. The current crafting station [is appropriate for] this item. 4. The player [has not] maxed out their [crafting skill for this item] skill. If you were to define that trigger and then open the crafting menu, then ItemTrig would attempt to automatically deconstruct any intricate equipment in your inventory -- but only if you haven't already maxed out the relevant item skill! One word of warning, though: ItemTrig will do exactly what you tell it to, even if that's not what you meant. How does this compare to Dustman? Dustman is fast and much simpler to set up. It's an excellent mod, and if you're not looking to perform specialized tasks, then it's the mod for you. ItemTrig is more useful for specialized tasks. You may wish, for example, to destroy low-rarity stolen treasures unless they're useful for the Covetous Countess quest, in which case you might want them laundered instead. You may wish to destroy stolen lockpicks if you already have a full or nearly-full stack of "clean" ones. 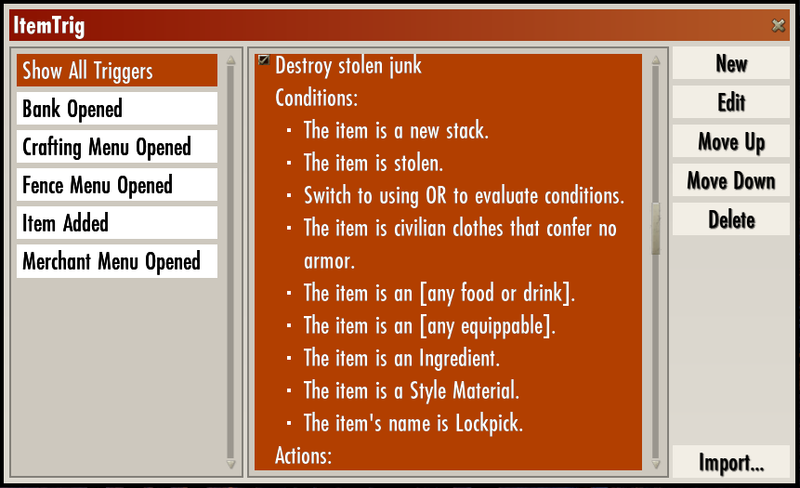 You may wish to destroy incoming equipment unless it belongs to a specific item set. ItemTrig gives you the building blocks to do any of these (and much more), but you have to assemble those building blocks yourself. The ability to do so is ItemTrig's raison d'être. This add-on requires LibAddonMenu-2.0 and LibStub to function. 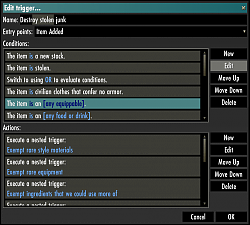 You can open the trigger editor via the add-on's options menu, or by entering /itemtrig edit in the chatbox. ItemTrig has a gallery of built-in triggers. You can import triggers from the gallery, or between characters, by clicking the "Import" button in the main window. Triggers can only run on items in your backpack. Your equipped gear does not count as being "in your backpack." When writing your own triggers, consider enabling "Pretend Mode" in the options when you're testing. This feature prevents ItemTrig from taking any action on your inventory, instead announcing the actions it would take. It's a good way to make sure your "destroy these items that I don't care about" trigger doesn't match more than it's meant to! 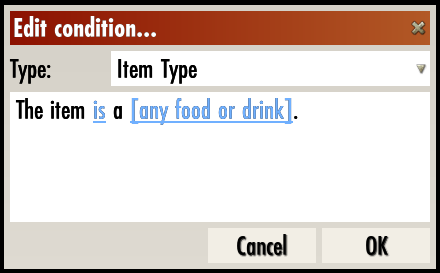 Added a new condition: "Item Type (Detailed)." 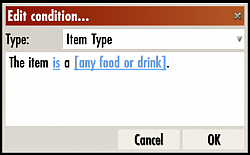 This condition can be used to check for very specific item categories, such as "Museum Piece." Added buttons to the trigger editor to duplicate a selected condition or action. Fixed window sizing for the condition/action editor. Sizing errors could be seen when editing conditions/actions with long values (e.g. a Comment condition with copypasta stuffed into it). Fixed theming for the condition/action option editor. Previously, explanatory text for some condition/action options didn't theme properly and was always in white print. The description for the "Covetous Countess" condition should no longer produce an incorrect sentence. Minor fixes to the "Deconstruct" trigger action: ItemTrig should no longer log both a "success" message and a "failure" message if a deconstruct is attempted and fails; if a deconstruct fails because your inventory is full, then all pending deconstructs will be aborted. Critical fixes to the "Deconstruct" trigger action; it will no longer fail silently after deconstructing a single item, and it now works on enchanting glyphs. 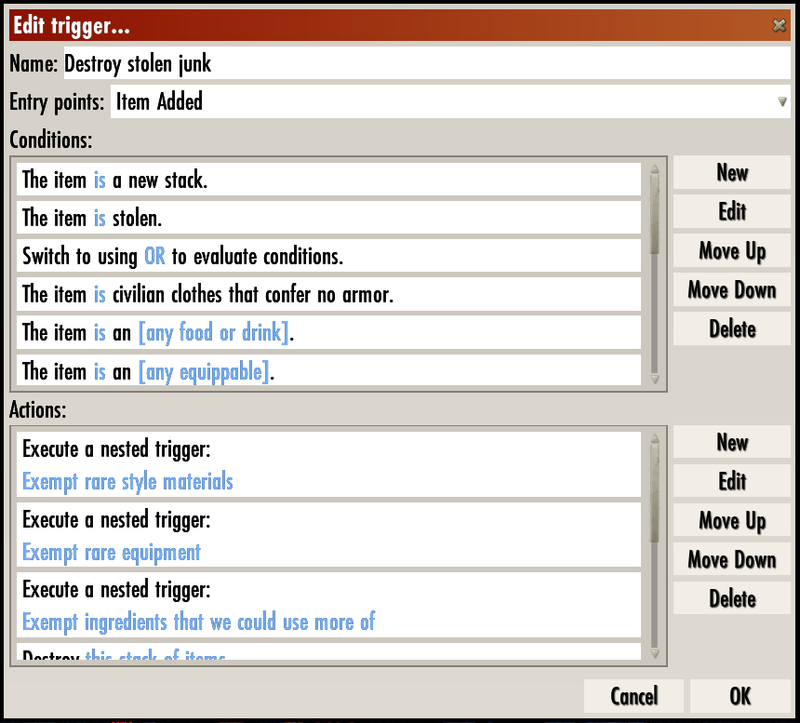 Fixed the "Pretend Mode" option: triggers will no longer continue to run on an item after pretending to destroy, deconstruct, sell/fence, or deposit it. Added a theme switcher to the add-on's options menu. Added more pre-made triggers to the Trigger Gallery accessible via the "Import" button. Fixed some pre-made triggers that would've logged errors if run on locked items. Fixed a bug with the "Esc force-closes the editor" option that made it always take effect even if disabled. Fixed spacing on the validation tooltip in the opcode argument editor. Deprecated the "Priority Sell" condition. Fixed a packaging mistake with the mod. The "Sell or Fence" action will now fail on locked items. Fixed the sort order for the rarities in the "Item Rarity" condition. 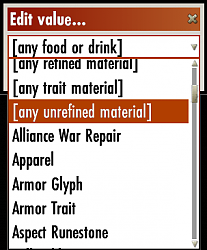 The "Sell or Fence" action's explanation text now properly identifies it as being usable in the merchant or fence menus. Fixed internal issues with quantity options (e.g. "at most 5," "at least 1") for conditions and actions. The item is an [any equippable]. The item is not flagged as junk. The item is not locked. Deposit 1 of the item in the Player's Bank. btw My max bank space as of right now in my bank is 480 and that is including the doubled space by ESO Plus. Last edited by Clazy : 04/21/19 at 01:14 AM. This is by design. ItemTrig only runs triggers on items in your inventory -- not banked items, and not equipped gear. I put the loot collected by five characters (100-200 items) to the bank and then deconstruct it with the crafter with max skills. Is this a strange case? How do I use this addon? Running triggers only on your inventory helps to keep things fast, helps keep things simple, and helps to minimize the consequences of user error. When I next have a chance to work on ItemTrig, I'll see about adding an option that will allow it to also run triggers on banked items explicitly in situations where that would be appropriate (the "crafting" and "bank" trigger entry points), but no guarantees. also deposits Bait in the bank. Is this a bug or is bait also valid provisioning? Bait is valid for provisioning. There are some recipes -- ones from the Witches Festival come to mind -- that use bait as ingredients. 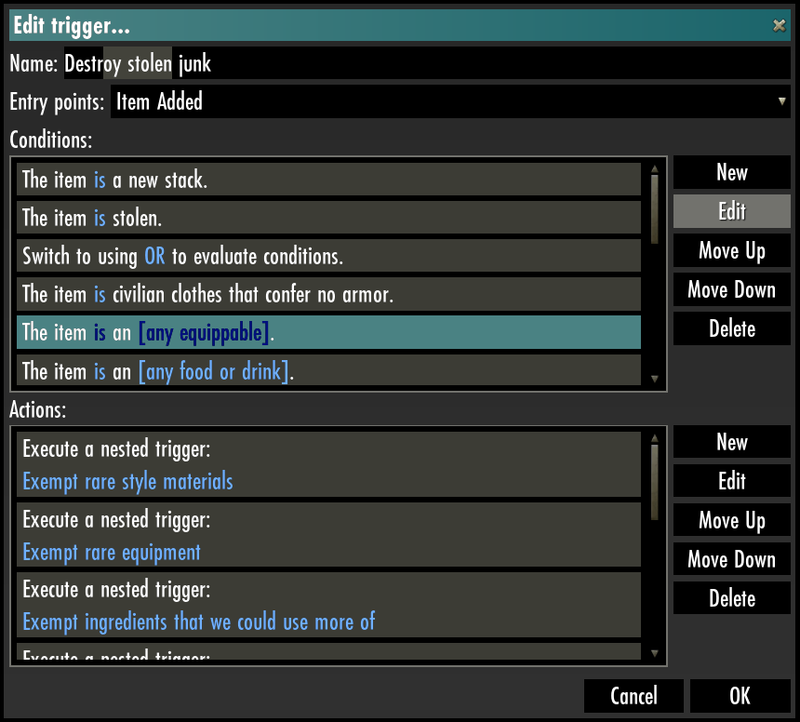 Trigger "The item is intricate => Deconstruct item" works only for items in player's bag and not works for bank items. can not withdraw from the bank? Nope. This feature is not implemented and not planned. actualy the auto-deconstruct (from the imported rules) do not work for me. Finaly nothing works actualy for me. Not working even with LibStub, it don't sell and deconstruct random items, not all complex. I'm going to need much more detail than this in order to look into the bug. Are you using the latest version of the mod? Triggers are per-character, not per-account. Are you experiencing problems on the same character that you used to import the trigger? What do you mean by "not working?" If you are seeing any UI errors, can you send them to me? Screenshots are fine. What items is it failing to deconstruct? You said you're using the imported triggers, so what are these items' rarities and sale prices? Are you at the right crafting station for deconstructing those items? If you enable the "Log actions taken on items" option, do any error messages appear in the chatbox? Last edited by DavidJCobb : 04/07/19 at 02:03 PM. Damn, I tried all the items managers, and if your addon make no big bug or lags, it's just FAR the best one, really. Last edited by palejaune : 04/06/19 at 08:54 PM. I must say I am initially impressed with your UI and widget helper code. Particularly your gamepad keynav (if it is what I think it is ) caught my attention. You must have spent a decent amount of time implementing interfaces before. Very unique and will definitely need to try your addon out if for no other reason, but to see this UI in action. Been itching to see some decent composable and/or extensible abstractions for ESO's Layout / Control GUI. There is no Refine action. Re: Great addon. Could use more work. Yes, a condition for SpecializedItemTypes is what I was thinking of adding. Thank you for saving me the time it would've taken to double-check. 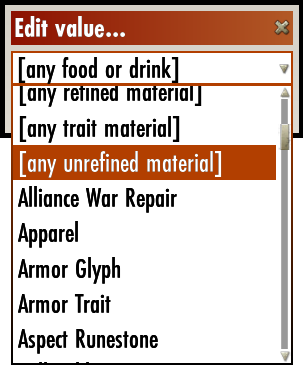 I already have an "Item Type" condition, but I can add spec-types as "Item Type (Detailed)" or something. I was wondering if there is a way to have ItemTrig withdraw certain items from the bank, say if I wanted to have all known recipes deposited to my bank while all the unknown recipes get withdrawn. As of now, I haven't been able to identify a method for performing this action to withdraw, only to deposit. There is no "withdraw" action. ItemTrig only runs triggers on your current inventory (which, notably, does not include the gear you're currently wearing/wielding). Great addon. Could use more work. Found this addon during my search for an up to date alternative to Inventory Manager. ItemTrig is a nice one to be sure. There's a bit of a learning curve to it, much like any addon of its kind, and I was wondering if there is a way to have ItemTrig withdraw certain items from the bank, say if I wanted to have all known recipes deposited to my bank while all the unknown recipes get withdrawn. As of now, I haven't been able to identify a method for performing this action to withdraw, only to deposit. Currently there isn't a way (that I can think of) to detect museum pieces. I think I know of something I can implement for this, so I'll put it on my to-do list. I can't find "Refine" action. Does one exist?